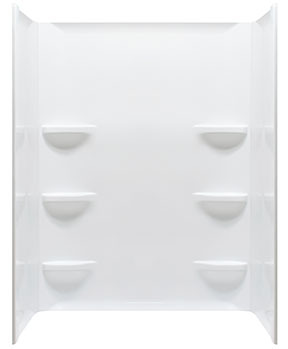 One piece units are available, but may be difficult to maneuver through hallways and narrow doorways. Fiberglass. Slip resistant floor. Molded soap ledges. Above the floor rough. With E-Z Pin System. Rear center drain. Complies with NAHB, HUD UM-73A, & ANSI-Z124.1.2. 6 year warranty. 8.5" threshold. Also see Instructions and Spec sheet. Fiberglass. Slip resistant floor. Molded soap ledges. Two molded seats 12"W x 16"D x 15"H. Center drain. Complies with NAHB, HUD UM-73A, & ANSI-Z124.1.2. 6 year warranty. 7" threshold. Also see Instructions and Spec sheet. Fiberglass. Slip resistant floor. 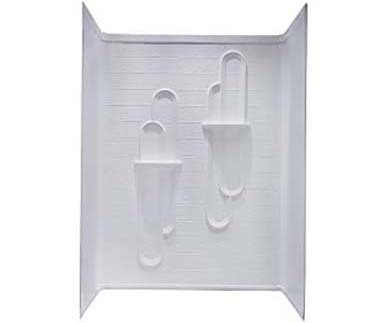 Molded soap ledges. 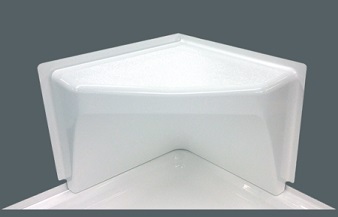 Two molded foot rests 5"W x 18"D x 14"H. Acrylic towel bar. Above the floor rough. Center drain. Complies with NAHB, HUD UM-73A, & ANSI-Z124.1.2. 6 year warranty. 8.5" threshold. Also see Instructions and Spec sheet. Fiberglass. 20"W x 20"D x 16"H. Textured seat. 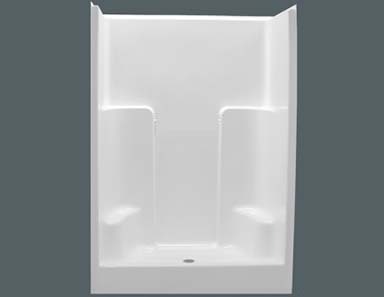 Mounts to most Clarion shower bases. Tiling Flange All Sides. Complies with NAHB, HUD UM-73A, & ANSI-Z124.1.2. Also see Technical Specifications and Installation Data. Fiberglass. Slip resistant floor. Above the floor rough. Left or right hand drain. Complies with NAHB, HUD UM-73A, & ANSI-Z124.1.2. 6 year warranty. 8" Threshold. Also see Instructions and Spec sheet. Fiberglass. Slip resistant floor. Above the floor rough. Center drain. Complies with NAHB, HUD UM-73A, & ANSI-Z124.1.2. 6 year warranty. 8" Apron. Also see Instructions and Spec sheet. 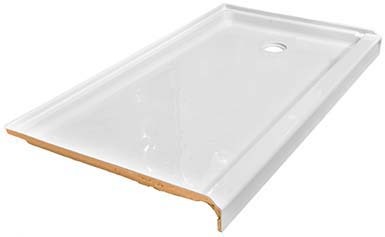 Replace any 27" x 54" tub with this ABS plastic shower pan. Fits in the same space with no plumbing change. (actual width is 28"). Also see Installation Data. 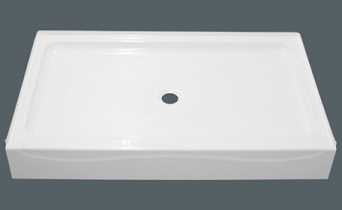 Made of durable ABS plastic with a built-in soap dish. Easy to install with adhesive or rivets (not included). 54" x 28". Left or Right hand drain. High gloss acrylic surface. Scratch and stain resistant. Spacious slip resistant area. Reinforced with fiberglass and OSB for maximum support. Flange screws direct-to-stud, no predrilling or clips required. 100% Robotic spraying improves quality and consistency. 5-year consumer, 2-year commercial limited warranty. Meets ANSI and CSA standards. Also See Spec Sheet. High gloss acrylic surface for a bright shine. Easy to clean, scratch and stain resistant. Two spacious shelves. Elite Wall design overlaps base to keep water inside. No drilling necessary, screw flange direct to stud. Easy one person installation for both new construction and remodel projects. 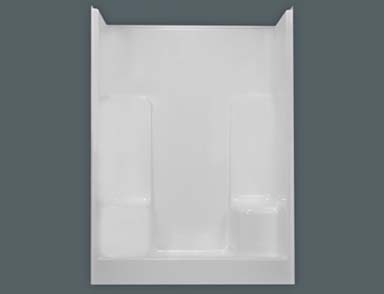 Compatible with most standard shower bases. Wall set includes one back panel, one left panel, and one right panel. 5 Year Consumer, 2 Year commercial Limited Warranty. 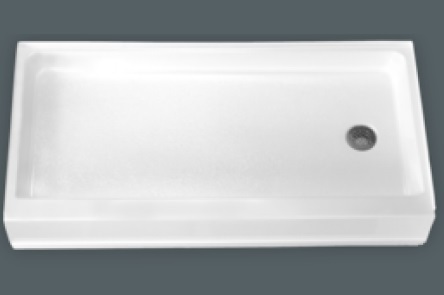 Also See Shower Wall Specs.